Fire departments across Northeast Ohio are gearing up for the Republican National Convention. Regional task forces, made up of neighboring departments, will prepare for the influx of people and organized protesters. 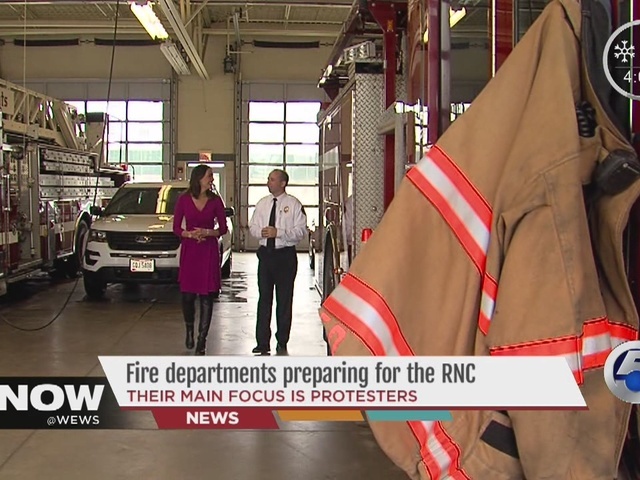 Lyndhurst Fire Chief Mike Carroll told NewsChannel 5, with the RNC coming to town, local fire departments are prepping for more than their daily grind. "The RNC is not just Cleveland, it's actually going to bleed over into the entire county and the entire region," Carroll said. Task forces are set up throughout the region, so departments can work together. Shaker Heights Chief and president of the Cuyahoga County Fire Chiefs Association Patrick Sweeney said department collaboration is key. "We've strengthened our relationships to prepare for an influx of people coming into town," Sweeney said. Large events will be held downtown, but communities outside of Cleveland are expected to host visitors as well. Carroll said departments will be ready to handle the increase in visitors. "The delegates are going to be all over. Staying in different hotels, different party centers, maybe shopping centers, so it requires our suburban communities to start identifying those venues and be prepared to have appropriate response if something, god forsaken, happens," Carroll said. Suburban departments will be on call to head downtown as well, according to Sweeney. "We're ready to go down and help them as a group from the suburbs," he said. There are multiple trainings, for all departments, over the next few months. One of their main focuses? Protesters. "It's not that there's any definitive threat or indication it's going to be bad, we just have to be prepared so that if something does go bad, we can handle it appropriately," Carroll said.